The Common Blue butterfly (Polyommatus icarus) is a widespread species in the UK. Many invertebrate species are very responsive to climatic fluctuations and the abundance of this species has been shown to correlate with the mean June-August temperature. 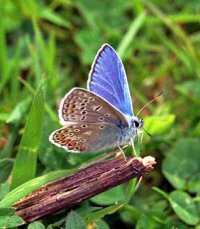 If average summer temperatures increase we might expect an increase in the number of Common Blue butterflies. Please click on the markers to see the graphs. You can also view the graphs side-by-side to aid comparison. Website design and interface development by Susannah Rennie - srennie@ceh.ac.uk.